How do I try gliding? The easy answer is Just Book a Flight and come along. 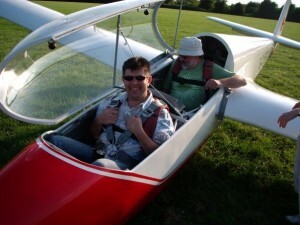 We really enjoy gliding and our aim is to ensure that you really enjoy it too. We also sell Vouchers that you can give as a present , and we organise Group Evenings during the week. You can book to come along for a Trial Lesson with hands-on instruction, or an Air Experience Flight just to enjoy the scenery flight, on most days that we are flying. We fly on Tuesdays, Thursdays & weekends from April to September, which is the main gliding season when the weather has a chance of being sunny and not too windy. For the rest of the year, we fly regularly every Saturday and Sunday, along with an ad-hoc day during the week, weather permitting. If you do it this way, a flight including 28 days club temporary membership costs £55 (Trial Lesson), or £45 (Air Experience Flight). During the winter (November to February) when flights are typically shorter, you can take advantage of our reduced winter rate which is just £45/£35 for your first gliding flight. that you really want join the Club. and join the Club as a result. All aircraft benefit from some wind during the launch and landing, so airfields are usually sited in exposed windy places. Snitterfield is no exception. If you’re coming along to visit us, come prepared for the weather. On a cold day, the wind can go straight through you, so make sure you have warm windproof clothes and waterproof shoes. On a warm day, a lightweight windproof jacket may still be a good idea because there’s little shelter at the launchpoint. On a hot day, any wind is a blessing. On the other hand, sun glasses, a sun hat and sunblock are essential. Don’t wear your best clothes, they’re bound to get creased when you’re strapped tightly into a glider. Jeans or slacks, sweaters, shorts, T-shirts, trainers and the like, are typical glider-pilot attire. If you’re coming for a full day or longer, it might be a good idea to bring a pair of working gloves, because we will be asking you to help out at the launch point. Some people enjoy mucking in more than others, of course. If you want to take pictures during your flight then this is usually possible provided that the camera has a strap so that it can be securely attached to you and it cannot be dropped inside the glider while you are flying (so no mobile phone cameras).